The overall "trend" for the number of Commanders per Faction shows the Empire Faction having a ⬆ Increase, while the Rebel Faction shows a continued ⬇ Decrease. It is a continued hoped that once Zynga starts taking control and releasing game updates that there will be a reverse of the downward trend of Commanders especially for Rebel Faction. Last edited by DeathStriker on Wed Nov 07, 2018 2:44 pm, edited 1 time in total. - The Rebel faction has reduced from 72,164 to 70,373 a loss of 1,791 commanders. The faction split is now 58:42 in the Empire's favour, as before. The Empire faction increase follows a conflict for the much sought after rodian skin, a skin that buffs their GR. It seems to have reversed the loss of players over the previous month. Although the equivalent skin was available for the Rebel faction, it was not a useful item for the current state of the game. There was therefore no similar incentive to encouraged Rebel faction players to continue playing. 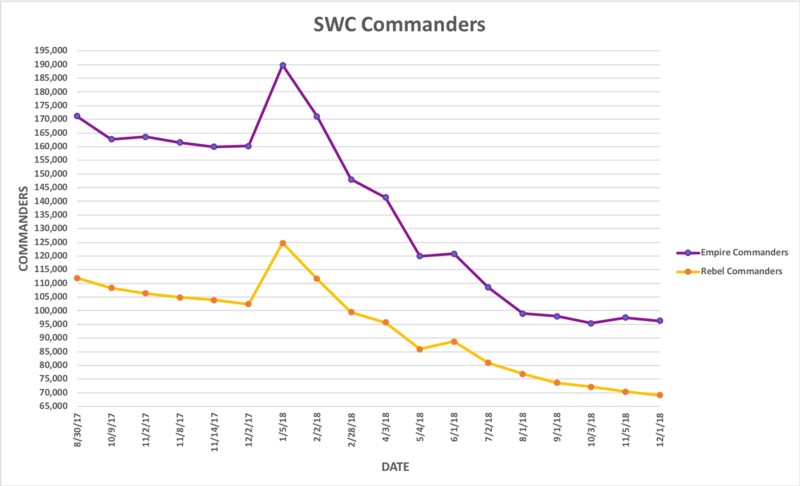 The reduction in rebel faction commanders over this month is greater than the previous months. The exacerbation of the GR imbalance issue (whether perceived or accurate) may have exacerbated this. Fortunately there is a New Hope for the Rebellion on this issue. Have I ever said you're an excellent poster? Because you are, not just here. This does seem to hint that Rodian sniper equipment was wanted enough to reactivate lapsed imperials. Actually, isn't this the first month with fully loaded dev bases and prestige? I'd wager those factors have a strong effect on playing as well. At least from my limited sample I've seen activity in my (Rebel) squad go up quite a lot with the introduction of Prestige and loaded dev bases and the response on this forum was very positive as well. 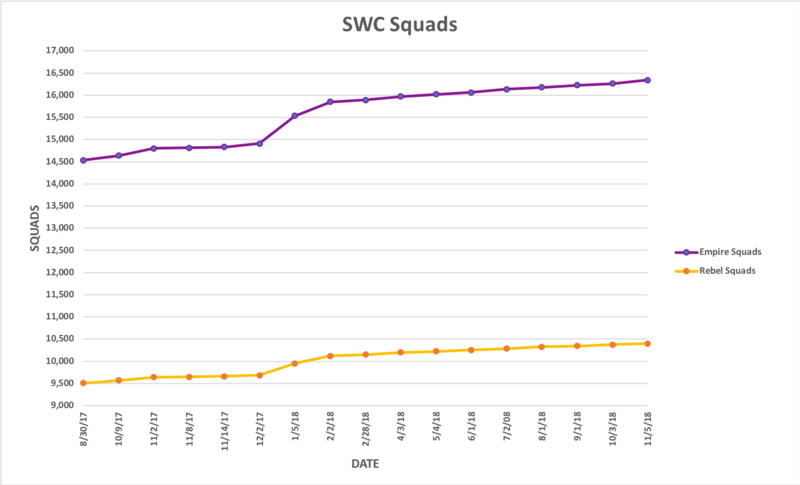 The worsening divide between Imps and Rebels are probably a big reason why SW matches have been more difficult to get lately. It's going to be very interesting to see what happens when the Sullustan sniper gr hits the playing field. TNT wrote: Have I ever said you're an excellent poster? Because you are, not just here. thank you, my friend. Praise indeed! TNT wrote: Actually, isn't this the first month with fully loaded dev bases and prestige? I'd wager those factors have a strong effect on playing as well. If you look up to post #279, where I posted last month's figures, you'll see the Prestige bases were already live. I agree Prestige has had a positive impact, but that hasn't prevented a lot of Rebel factions players leaving the game. Rodian frags were rare and sought after. As we know, they have made a huge difference to the game. Empire faction players, perhaps in contact with current players through LINE(?) have clearly spread the word, and former players have come back to the game for them. TNT wrote: The worsening divide between Imps and Rebels are probably a big reason why SW matches have been more difficult to get lately. I don't know what to make of War matchmaking at the moment. In SOD, we're struggling to get matches. We now regularly wait over 8 hours for a match, and two of our recent matches have been with rebel faction squads. Given the disproportionate number of Empire commanders, this is contrary to what you would expect. TNT wrote: It's going to be very interesting to see what happens when the Sullustan sniper gr hits the playing field. It really will. But as Spock has pointed out, getting frags for more than one level is going to be a challenge, as only 20 frags are available from each planet, and even then, only if you get UC. ObiWanKenobi2016 wrote: If you look up to post #279, where I posted last month's figures, you'll see the Prestige bases were already live. EVERYONE - View my Trend Analysis above to see links to previous KSoD Data Captures. 2 months already? Feels like it was last month. It feels a little weird to think that just Rodian Sniper skins would have such an effect on the activity numbers. You give good reasons, but from my vantage point it feels like just another skin with diminishing returns on investment. But I don't have a better explanation. Considering how generally undesirable Vanguard GR is (and by extension Shock trooper GR) would it then make sense if the activity of the imperials would decrease again. ObiWanKenobi2016 wrote: I don't know what to make of War matchmaking at the moment. In SOD, we're struggling to get matches. We now regularly wait over 8 hours for a match, and two of our recent matches have been with rebel faction squads. Given the disproportionate number of Empire commanders, this is contrary to what you would expect. True. I'll be happy if I can even get it to lvl3. I'll be happy with the unlock. I have a busy couple of weeks at work coming up. - The Rebel faction has reduced from 70,373 to 69,137 a loss of 1,236 commanders. The faction split remains 58:42 in the Empire's favour. The Empire Faction decrease still puts the number of commanders higher than they were in October. The Rebel Faction decrease has slowed. It is notable though that they lost more commanders than the Empire faction, despite being a small proportion of the player base. I had hoped that the GR Sharpshooter event might see Rebel faction numbers remain level, or even increase - as the Empire Faction had during the last rodian event. Unfortunately it was not to be. On the plus side, these are the slowest decreases we've yet seen. I wonder if this represent's 'A new Hope' for Zynga? 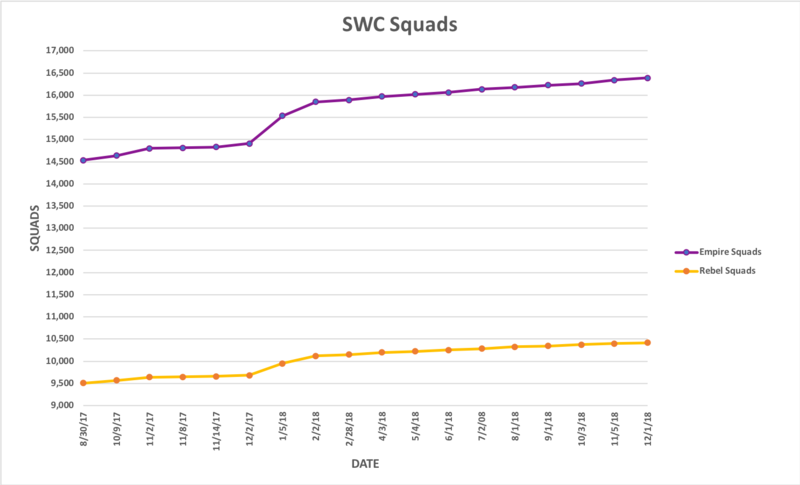 The overall "trend" for the number of Squad per Faction shows the continued slight ⬆ Increase. The overall "trend" for the number of Commanders per Faction for both the Empire Faction and the Rebel Faction shows a slight ⬇ Decrease but smaller than has been noted before leading to the appearance of a more "stable" number for now. It is a continued hoped that once Zynga starts taking full control and releasing game updates that there will be a reverse of the downward trend of Commanders especially for both Factions. Correct me if I'm wrong, but there hasn't been a full month of Rebel SS GR in the wild yet, right? I think considering what has been done in the past month this is about what I would expect. Shock troopers GR aren't a game changer, meanwhile I see Rebels on line and Discord posting increasingly longer strings of victory since the introduction of the SS GR. There's a week of enhanced ATAP/ATMP in there, which in general is viewed as a joke. I am most curious to see what the numbers will be this month. Will the SS GR cause Imps to leave as many rebels have left since the introduction of the Sniper GR. My guess would be yes.